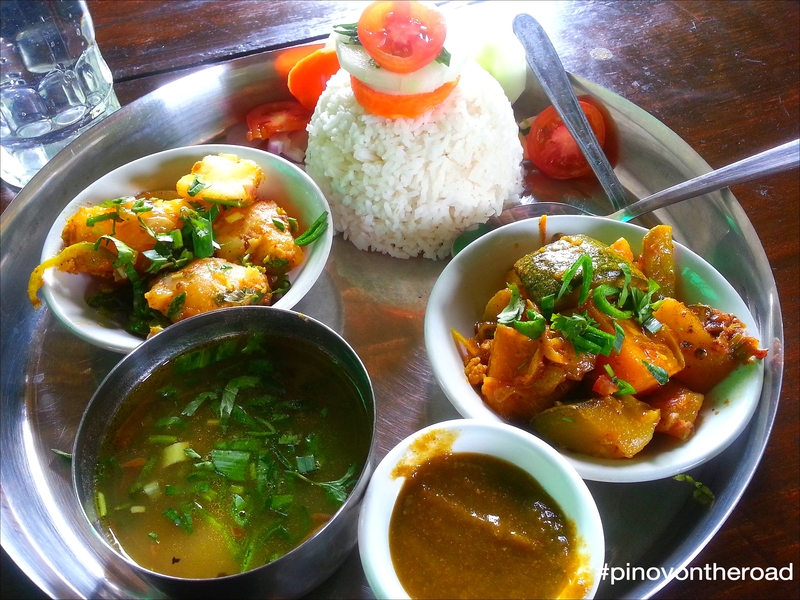 Dal Bhat is Nepal’s traditional dish and a staple food consisting of steamed rice and lentil soup. I had my first try of Dal (lentil soup or munggo in tagalong) Bhat (steam rice or kanin in tagalong) for lunch on my first day in Kathmandu. Dal Bhat is traditionally served with other vegetables along with curry and small serving of pickles. The Dal or the lentil soup is cooked with tomatoes, onion, chili, tamarind, garlic and ginger in addition to lentils or beans. It contains herbs and spices such as coriander, garam masala, cumin seeds and turmeric. The recipe of Dal bhat can vary from ethnic groups to another. Dal Bat is inexpensive yet hearty meal normally valued less than 100 NPR or 50.00PHP. I personally think that Dal Bhat is an excellent dish, flavorful and makes a hearty and scrumptious meal at anytime of the day. Dal Bhat provides plenty of much needed carbohydrates and proteins. It is a rich and energetic food and it is main dish rather than a side dish. I’m leaving for Nepal in a week and am so excited to try this!! Do you have any idea of whether or not it’s gluten-free? Do you know if there is any flour or wheat involved in preparing it? I’m hoping not! hi rachelynne. some variations use flour. i tried one in a restaurant enroute to pokhara. you can always ask if its flour. enjoy nepal. its super awesome! So that’s the case? Quite a reveiatlon that is.